If You Have Answered YES, Then Just Give Me 10 mins to Watch the Video Below, And I Will Give You At Least *500 Hours* of Productive Time Back A Year! I’ll tell you right now. The main secret to gaining ever greater success and rewards in life is to MANAGE YOUR PSYCHOLOGY. You can’t manage time, time is fixed! You can only manage yourself, but your behaviours are governed by your psychology, how you think and feel, sometimes referred to as EMOTIONAL INTELLIGENCE. Successful people, whether on purpose or by chance, have a certain way of thinking, feeling and organising their lives which creates even more success, and this course gives you BRAIN RETRAINING techniques designed to get you into the same mindset. In order to do this, you have to manage the way the mind thinks and feels, and these skills can be learned quickly and easily. In Neuro-Lingustic Programming (NLP) this is called “Modelling” – you can use the same strategies that highly successfully people use to create success, both in terms of their thoughts, their feelings, their actions, and their Advanced Time Management Skills. This program trains your brain to achieve this and more. The final secret is having a POWERFUL TIME MANAGEMENT SYSTEM in place that manages all aspects of your life. I have spent 10 years working with busy professionals and refining this system until it works for the vast majority of people. And most people report saving 1-2 Hours a day and getting more done in a relaxed way! But I am going to offer this video course for a VERY LIMITED PERIOD for only $97! And I am so sure that you will love the training and find it incredibly powerful, I am offering a 60 Day Cast-Iron Money Back Guarantee. Following purchase you will be directed to a secure download page where you will be able to download all the videos, handouts and bonuses. This DVD package is for personal home use only and cannot be used within the workplace. Prices include FREE worldwide delivery. 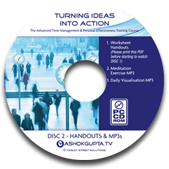 This DVD package can be used in the workplace, e.g. within an internal training lending library. Prices include FREE worldwide delivery. Any one of these Modules would be worth more than $97 in themselves, given the value they create in people’s lives. Can you really afford to live a life of quiet desperation, not knowing these incredibly valuable Time Management Productivity Secrets?